Sat Apr 13 @ 4:30 pm: Hudson Valley Shakespeare Troupe for a live performance of William Shakespeare's Julius Caesar. 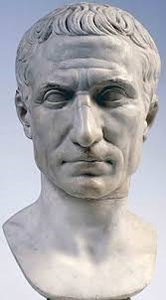 A charismatic war hero on the brink of kingship, Caesar is celebrated by the people of Rome – but mistrusted by some of his closest friends who fear his popularity will throw the country into chaos. Plots are hatched and factions emerge, and in the end, 23 daggers and the fall of a few guilty players lead the people to violent justice. In the Hudson Valley Shakespeare Festival’s immersive, 90-minute production, this tale of betrayal comes to life, constructing a post-apocalyptic world of power and consequence. Directed by Illana Stein. Followed by a talk-back with the actors. Recommended for grades 5 and up. 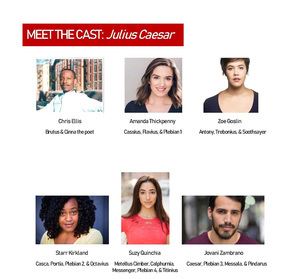 Featuring Zoe Goslin (Antony), Starr Kirkland (Portia/Casca), Susana Montoya Quinchia (Calpurnia), Christopher Robert Ellis (Brutus), Amanda Thickpenny (Cassius) and Jovani Zambrano (Caesar). Additional crew includes Diggle (Set Designer), Anthony Paul-Cavaretta (Costume Designer), Alexis Black (Movement and Fight Director), Titus Tompkins (Composer/Sound Designer), and Christopher Denver (Stage Manager). This production is part of Shakespeare in American Communities, a program of the National Endowment for the Arts in partnership with Arts Midwest. This program was sponsored in part by a generous grant from the M&T Bank Foundation.